You can invite new team members right inside Deekit application and also from the Admin page. Enter the email address(es) of the person(s) you’d like to invite. Click on the Send invites button to invite. You can see and manage your team members and all pending invitations from the Admin page. Click on the Invite People from Team panel. 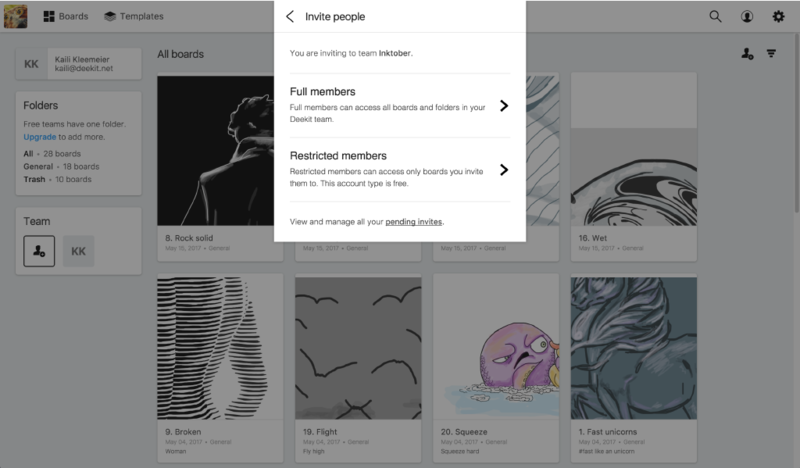 Choose if you want to invite full team member or add a restricted member with access to sing board. Enter the email address(es) of the person(s) you’d like to invite. You can also write your custom message for the invite. Note: Administrators can restrict and allow non-admin members of their team to send invitations. You’ll find this setting on the Permissions page. Pending and accepted invitations for your team can be viewed on the Pending invites page. You can also resend or delete an invitation when you click the name of the team member you invited. Delete invite will remove it from your list and prevent any delivered invitations from being used. Resend Invitation will deliver a fresh email invitation to the team member’s inbox, in case it expired or was lost. Note: All basics to collaborate with Deekit with small teams are free and always will be. Teams with 5 full members or more are asked to upgrade. Premium subscriptions add features such as advanced access management, using advanced shape library that includes all kinds of shapes for all purposes and adding any content from the web. You can find more details on the Pricing page.